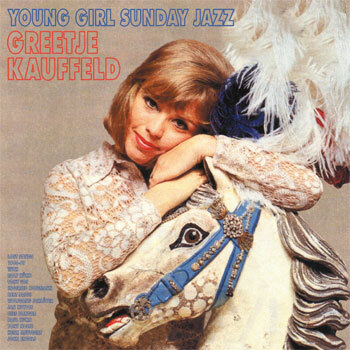 This new compilation "Young Girl Sunday Jazz" makes Greetje Kauffeld`s lost jazz songs from the 1960s available on CD and vinyl LP. Mainly included are recordings from the private vaults of the singer or from musicians` and collectors` archives, with music performed between 1960 and 1969 at concerts, in the studio or at sessions for radio and tv. Greetje in top form, accompanied by some of the most excellent Dutch and German jazz musicians! Moreover, all four tracks of her first and only jazz EP from 1960, entitled “Makin` Whoopee”, are reissued here for the first time. The 16 remastered songs fill a major gap in her discography. 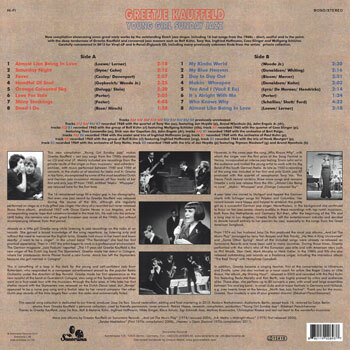 Not even one jazz record by Greetje Kauffeld was released during the course of the 60s, although she regularly performed on stage as a truly gifted jazz singer. Her story of a recorded but never released Bossa Nova album, produced 1967 with Oscar Castro Neves in Los Angeles, and its corresponding master tape that somehow landed in the trash bin, fits well into the picture: Until today, she remains one of the great European jazz voices of the 1960s, but without accompanying releases from that period. Already as a little girl Greetje sang while listening to jazz recordings on the radio or on records. She gained a broad knowledge of the song repertoire, by listening only and without the need to memorize the English lyrics. Greetje had music in her heart and knew exactly: "I want to be a singer". In the school band “The Raindrops” she had her first practical experience. Then in 1957 the artist began to work in a professional environment. The German magazine "Jazz Podium" reported: "The 17-year-old Greetje Kauffeld is the new singer of the Dutch big band The Skymasters. Greetje made her debut in Cologne, where her predecessor Annie Plevier found a new home. Annie has left the Skymasters because she got married in Cologne". This is something of a leap in the dark for the young and self-confident lady from Rotterdam, who responded to a newspaper advertisement placed by the popular Radio Orchestra under the direction of Bep Rowold. Greetje made her first appearance as the new vocalist of the band at Guerzenich Cologne, also sang at the Tanzbrunnen and then went on a four-week tour with the musicians through the Ruhr area. A little later her first shellac record with the Skymasters was released on the Dutch Decca label, but "Kindje" appeared to be a naive pop song and a foolish idea by her record company. Her other Dutch pop records of the time largely flew under the radar and commercially failed. However, in the same year the song "Who Knows Why", with which the singer won the first prize at the Song Festival in Venice, incorporated an intense jazz feeling. Erwin Lehn sat in the audience and invited the young artist to work with his Big Band of the South German Radio. 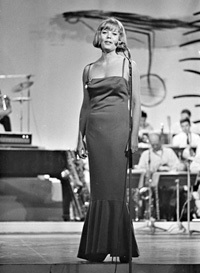 As late as 1960 a recording of the song was included in her first and only Dutch jazz EP, produced with the quartet of saxophonist Tony Vos. This Decca 7inch record contains three more songs and remains Greetje`s only jazz release from the 60s: "Almost Like Being In Love", "Makin` Whoopee" and "Orange Coloured Sky". A year later she moved to Stuttgart and topped the German charts with Schlager songs for Polydor and Columbia. Her record bosses were happy and helped to establish the pretty girl as a successful German pop singer. Nevertheless, in the background she continued to focus on her jazz career, clearly audible in these recordings with top-notch musicians, both from the Netherlands and Germany. But then, after the beginning of the 70s and a long stay in Los Angeles, Greetje finally left the entertainment industry and decided to devote herself entirely to her passion for jazz, especially to the songs from the Great American Songbook. From 1974 on, her husband Joop De Roo produced the vocal jazz albums "And Let The Music Play" (arranged by Jerry Van Rooyen and Rob Pronk), "He Was A King Uncrowned" and "Some Other Spring". Most of the included songs were already re-released on Sonorama Records and have been sold in many countries. During those times, Greetje performed with the who's who of the European jazz elite and with American stars such as Phil Woods, Stan Getz, Mark Murphy or Herb Geller. In the 1980s and 90s she also released outstanding jazz records as a freelance singer, including the marvelous album “The Real Thing” with Humphrey Campbell. In addition, Greetje became a singing teacher, first at the conservatories in Hilversum and Zwolle. 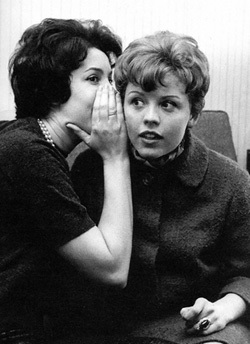 Later she also worked as a vocal coach for artists like Roger Cicero or Ulita Knaus. Her album "My Shining Hour", released in 2005 and recorded with the Paul Kuhn Trio featuring Paulo Morello and Kim Barth, was highly praised by critics and audiences alike. These days, she perfoms up to 80 concerts a year, with small and large ensembles between Trio and big band - in small clubs and at major festivals in Germany and Holland, e.g. over twenty times at the famous "North Sea Jazz Festival". Thank you for the music, Greetje. Your modesty is one of your greatest charms! This special song collection is dedicated to our friend, producer Joop De Roo. cover artwork: Patrick Haase, research, compilation, production “Young Girl Sunday Jazz”: Ekkehart Fleischhammer. Sigi Schmidt-Joos, Mathias Kuennecke, Christopher Klaese and last not least the wonderful musicians.